Once upon a time, a long long time ago there was a girl. She was a young, single restaurant manager. One day a long-haired boy came to her and asked for a job. He was not well dressed and she thought she would not hire him in his cut-off shorts and tank top. Her good friend, however, saw potential in the boy and convinced her to offer him employment. A short time later the boy and the girl went, seperately, to a holiday party. Because of a tradition known as "draw a name out of a hat and buy someone a gift" the girl had to give the boy with a present. She bought him a bottle of glittery magical Goldschlager, which he kindly shared with her. That evening they kissed for the very first time. But all was not well. The owner of the restaurant did not want the girl to date her employees so she complied and did not date the boy. Time passed and the life went on. The boy and girl continued to work together. Then the boy get in trouble at work and he was given a stern warning ... be late for work again or don't come to work, and you're fired! Lo and behold, he got in trouble again and the girl had to fire him. The two talked, the girl explaining why he was fired and feeling none too happy about it because he was a nice boy (and cute too). After listening to the girl the boy simply said, "Well, since I don't work here anymore can we go out sometime?". And they did. And that was just the beginning. 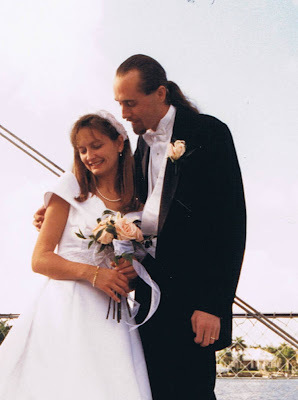 Today is our 11th wedding anniversary. And then, 5 months later, the story ended with an unexpected plot twist. The girl and her children are living their story as we speak, and while it's not a fairy tale it's a pretty blessed and magical life where the pages keep turning to new and different adventures and experiences ... yes, that's it. Congratulations; hope your day is a beautiful celebration of your love. happiness to you!!!!! what a sweet story. and, his hair ROCKS! Love love stories! Sniff, sniff! Happy 11th and many more! The best thing to every happen to me happened 11 years ago! I love you Jody!